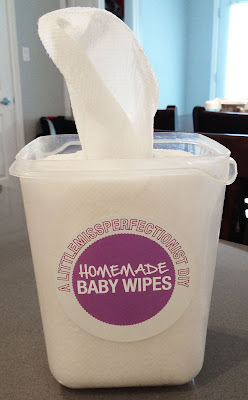 Little Miss Perfectionist: Homemade Baby Wipes! Many people are interested in diy wipes since most of the leading brands do have some questionable ingredients in them. Luckily, homemade baby wipes are super easy to make! I kept it super simple for this one. 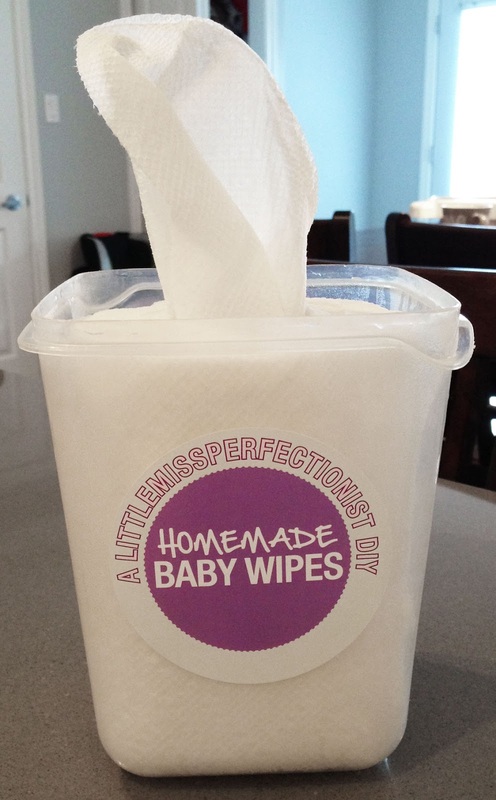 I've see recipes out there with many more ingredients which sound great (I have many ingredients at home since I make many homemade recipes for my home and my baby), but so many of you out there don't, so I thought the more simple the better :) You can also use these wipes for whatever else you would want to use wipes for! A good size storage container that fits your paper towel roll. First, cut your paper towel roll in half with a good knife! 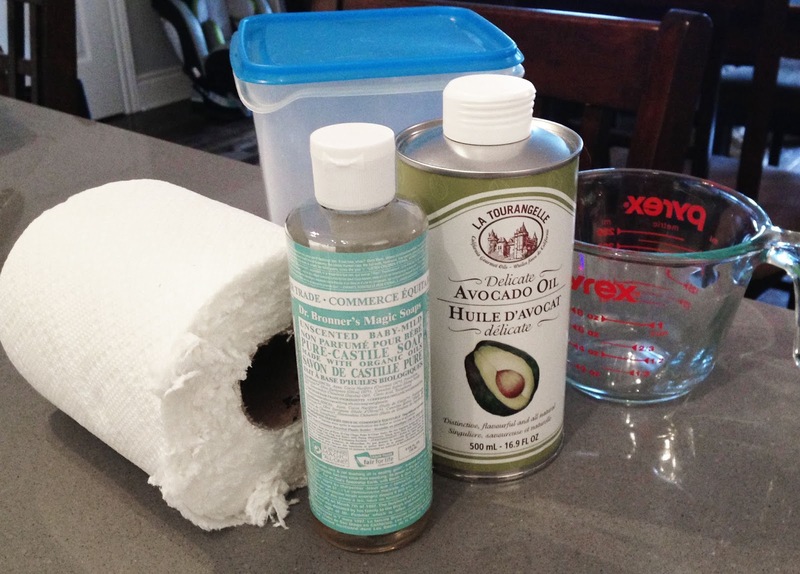 Place your half paper towel roll in your container. Get your 1 cup warm water ready (I made it slightly warmer than warm), Then pour your 1 tbsp of castile soap and 1 tbsp of oil in the water, make sure to stir well. 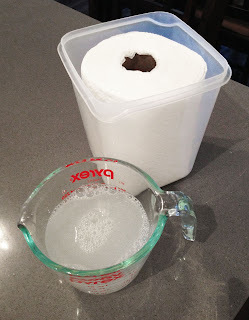 Pour all the liquid on the top surface of your paper towel roll. 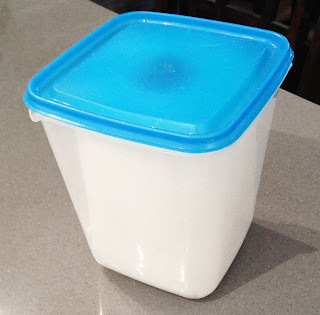 Cover your container and let sit for 10-15 mins after which you will want to flip the container upside down and let sit another 10-15 mins. Once your time has gone by, you're now ready to remove the cardboard center piece to enable the easy pull out feature. Mine was pretty easy to remove, but since it was damp, you want to remove it carefully not to tear it. And voila! You're done! 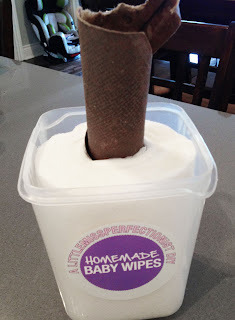 Now, if it were this simple, everyone would do this...The tricky part is storage...Since your wipes are wonderfully natural without any chemical preservatives, you don't want to just leave it out on your changing station since it can and will spoil (unless you only plan on using it for a day or two) but I always like to be safe so I place mine in the fridge (for a max of 4-5 days then throw them out and make a new batch). When I change my girl, I bring it with me to her room, place it in my hands for a couple seconds to warm up, then use. I then bring it back to the fridge. Some people might be turned off with that, but its a safer way to use wipes if that's something that interests you, if it does, that one drawback isn't too big a deal :) For the label, lol, I'm a graphic designer and couldn't bring myself to just write on the container with a magic marker with chicken scratch since I do like things to look nice and tidy (I am a little miss perfectionist after all) so I made a quick label. You can totally download it for yourself if you like! Either print it on sticker paper or use tape to stick it to your container to make it look cute! You can download it here.